In-vitro fertilisation clinics and laboratories are extremely sensitive areas, where the Indoor Environmental Quality could impact the rate of success of fertilisation. Prasad Natraj discusses air filtration methods for such spaces. Air filtration plays a major role in controlling air-borne contaminants for industrial, commercial and healthcare applications, which is a well-illustrated and documented subject the world over. The air systems serving critical applications, like biotechnology, pharmaceuticals and life sciences, are designed to provide and maintain environments by maximising the control of air-borne contaminants, both viable and non-viable, and to minimise the process defects, assure product quality and provide for worker safety and well-being. 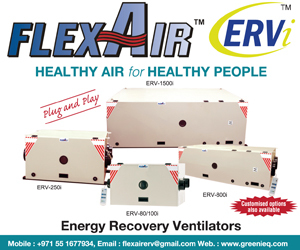 However, due to the presence of Air-borne Molecular Contamination (AMC) in gaseous or vapour form coming from the outdoor air, which includes carbon monoxide, nitrogen oxides and sulphur compounds, along with indoor pollutants, which are commonly caused by the off-gassing of materials/equipment like printers, toners and carpets, the air is a complex mixture of various AMC contaminants and is very reactive. It is, thus, detrimental to specialised processes and results in poor air quality, and is a health hazard. 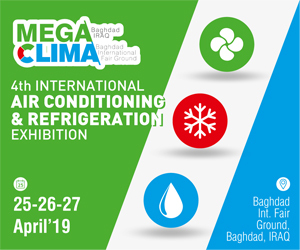 With a lot of hydroncarbon activity in the Middle East, and air conditioned spaces, it is necessary to control the presence of AMC for critical applications. In vitro is Latin for “within the glass”. In the context of fertilisation, it means that the fertilisation of an egg is performed outside of a living organism. This means an egg is fertilised by a sperm within a laboratory environment. This applies to both human and animal fertilisations. This article specifically covers the human application. IVF is typically used for couples who have fertility problems (male or female). The fertilisation of the egg is performed in the laboratory and subsequently placed into the female for a “normal” pregnancy term. There are, of course, many variations of this process, including surrogacy (a volunteer host serves as non-biological mother for the pregnancy term). Gaseous contaminants are present in levels that exceed those found in other buildings, such as homes and offices. Sources of contaminants are outdoors, adjacent building areas and within the lab from process-based activities, including compressed gases, cleaning and sterilising agents and stored materials. The effects of gaseous contaminants on the IVF process is significant, resulting in a threefold decrease in success rates in one of the studies. Research on the effects of gaseous contaminants within IVF laboratories have resulted in the researchers’ recommendation to use gas-phase filtration in IVF laboratories. 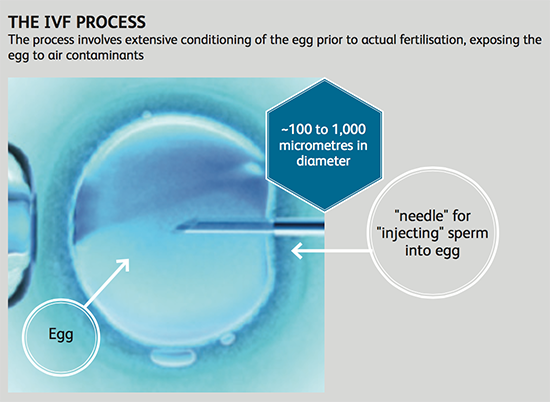 Typically, an IVF process costs USD 10,000 to 15,000 per cycle. The success rates range from nil to 50%. Success rates are dependent on many factors, and the generally low success rate impacts people’s decision whether to pursue IVF as an option or not. Insurance companies typically do not cover such procedures, and couples have to pay for the IVF procedure. IVF clinics have a need for clean air to keep the success rates high. One way is to positively pressurise the areas with outside air, in an effort to reduce the effect of various internal sources. However, the outside air has been found to contain contaminants that negatively impact success rates, as well. Many facilities across the United States have reported decreases in pregnancy rates that are related to AMC. The internal contaminant sources that can affect such labs include the analytical procedures, cleaning processes, compressed air, pesticide use and building materials off-gassing. Other sources external to the lab may include power production processes, automobile exhaust, cooling towers and urban air quality, as explained earlier. 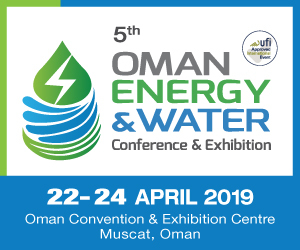 Apart from HEPA filtration, it is highly recommended to include specialised chemical filtration, since the contaminants are very small in diameter and are in suspended mode. Chemical filtration, or dry scrubbing, is essential for effective removal of AMC. Adsorption and chemisorption are the two primary methods being employed by dry scrubbing media to scrub the contaminant gases. 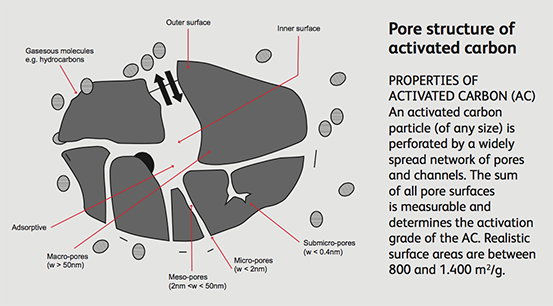 These engineered chemical media have high surface-area-to-mass ratio and have open-structured micro and meso pores. Activated carbon or activated alumina with certain chemical impregnants are used, which effectively react with the target contaminant, AMC and gases. Adsorption is the physical process by which intermolecular forces (identical to vander waal forces) hold the adsorbate (contaminant) to the adsorbent (engineered chemical media). This is a physical phenomenon in which contaminant retains its individual properties and reaction is reversible, while the process of chemisorption is an active chemical interaction between the adsorbate and adsorbent, and the process is not reversible. Most of the chemical filtration or dry gas scrubbing involves both the processes in the removal of molecular contaminants. ASHRAE-rated particulate filters and, typically, two or three stages of chemical filter modules are employed to scrub the contaminant gases before the air enters into an IVF laboratory. Alternatively, recirculation systems with similar filtration modules are also employed to scrub air within the space. The presence of AMC and levels of contaminants can be detrimental to the IVF process, and at a molecular level, the air quality is a very important factor for the success rate of in-vitro fertilisation. As results from various studies conducted across the globe indicate, the correct use of AMC filtrations resulted in higher pregnancy rates. Moving forward, the use of specialised chemical or AMC filtration for existing laboratories/centres is recommended. Stanley, WBM, Muller, C. (2004). Application of Dry-Scrubbing Air Filtration to Control Airborne Molecular Contaminants in the Pharmaceutical, Biotechnology, and Life Science Industries. European Journal of Parenteral & Pharmaceutical Sciences. 9(1): 3-9.